What makes for a good life, or a beautiful one, or, perhaps most important, a meaningful one? Throughout history most of us have looked to our faith, our relationships, or our deeds for the answer. But in A Significant Life, philosopher Todd May offers an exhilarating new way of thinking about these questions, one deeply attuned to life as it actually is: a work in progress, a journey—and often a narrative. Offering moving accounts of his own life and memories alongside rich engagements with philosophers from Aristotle to Heidegger, he shows us where to find the significance of our lives: in the way we live them. May starts by looking at the fundamental fact that life unfolds over time, and as it does so, it begins to develop certain qualities, certain themes. Our lives can be marked by intensity, curiosity, perseverance, or many other qualities that become guiding narrative values. These values lend meanings to our lives that are distinct from—but also interact with—the universal values we are taught to cultivate, such as goodness or happiness. Offering a fascinating examination of a broad range of figures—from music icon Jimi Hendrix to civil rights leader Fannie Lou Hamer, from cyclist Lance Armstrong to The Portrait of a Lady’s Ralph Touchett to Claus von Stauffenberg, a German officer who tried to assassinate Hitler—May shows that narrative values offer a rich variety of criteria by which to assess a life, specific to each of us and yet widely available. They offer us a way of reading ourselves, who we are, and who we might like to be. Clearly and eloquently written, A Significant Life is a recognition and a comfort, a celebration of the deeply human narrative impulse by which we make—even if we don’t realize it—meaning for ourselves. It offers a refreshing way to think of an age-old question, of quite simply, what makes a life worth living. In "A Significant Life," May has produced a tour de force. It is a thoughtful, subtle, beautifully written discussion of what it takes to live a meaningful life. A careful study of this book will tell you what it takes to make life worth living. It is refreshing to encounter someone worrying about such a big question in the small-minded times we live in, and an absolute joy to discover that he may actually have provided an answer. --Barry Schwartz, author of The Paradox of Choice: Why More Is Less"
In this eloquent and inspiring book, May argues that meaning in life is not given to us by God or the universe; nor is it, as the existentialists claimed, something we invent for ourselves. It is found instead in living in accordance with what he calls narrative values, which inform and structure our lives as wholes. May s arguments are often illustrated with examples drawn from literature and his writing is frequently lyrical, though always accessible. The book does not claim to reveal the meaning of life. May is a seeker rather than a proselytizer. Indeed, it is in part because he is not content with simplistic certainties that he is able to offer such wise guidance in our efforts to understand how and why our lives matter. --Jeff McMahan, author of The Values of Lives"
In A Significant Life, May has produced a tour de force. It is a thoughtful, subtle, beautifully written discussion of what it takes to live a meaningful life. A careful study of this book will tell you what it takes to make life worth living. It is refreshing to encounter someone worrying about such a big question in the small-minded times we live in, and an absolute joy to discover that he may actually have provided an answer. 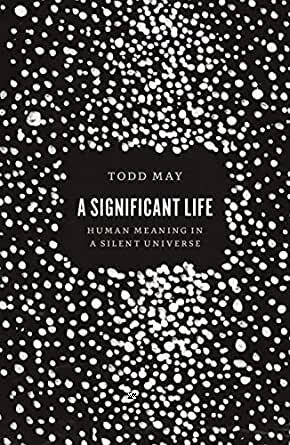 --Barry Schwartz, author of The Paradox of Choice: Why More Is Less"
Todd May is something of a legend, known for his lively, conversational style of discourse, and this book on no less than the meaning of life showcases all of his best features. It is engaging and clear, with vivid examples from literature and May s own life. It addresses a topic of very broad interest, yet it does so in a philosophically sophisticated way. Despite Pierre Hadot s claim that all ancient philosophy was about the meaning of life, there is surprisingly little engagement of the question by contemporary philosophers. May s book fills this void marvelously. --Charles Guignon, author of On Being Authentic"
This is an engaging, beautifully written book that grabs the reader from the first page something one cannot often say about a philosophy book. More important, May has given us a wise, humane reflection on one of the central questions of philosophy what makes for a meaningful life? While accessible to a broad audience, A Significant Lifealso makes a significant contribution to the scholarly literature.I highly recommend it. 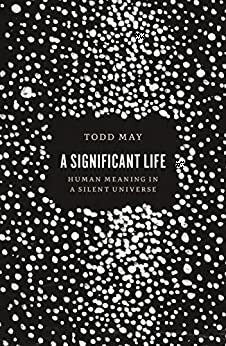 --Daniel Haybron, author of Happiness: A Very Short Introduction"
"Todd May is something of a legend, known for his lively, conversational style of discourse, and this book--on no less than the meaning of life--showcases all of his best features. It is engaging and clear, with vivid examples from literature and May's own life. It addresses a topic of very broad interest, yet it does so in a philosophically sophisticated way. Despite Pierre Hadot's claim that all ancient philosophy was about the meaning of life, there is surprisingly little engagement of the question by contemporary philosophers. May's book fills this void marvelously." 4.0 out of 5 starsGood book if you are philosophically inclined. Here is a simple summary (at the bottom). I was totally blown away by this book. And believe me, I've got lots of experience with other meaning of life books that left me with a mild pop or fizzle -- nothing close to the Yes, Yes, Yes I felt upon reading May's final chapters, which are marked by some of the clearest, most thoughtful, and inspiring writing about finding meaning in a "silent universe" (no God or other cosmic entity speaking to us) I've ever come across. The greatest compliment I can give to May's book are the tears that flowed from me after I finished it this morning and closed the cover. They came unbidden and unexpectedly, stimulated, I suspect, by his wise advice in those final chapters. It is not the "what" that gives life meaning, but the "how." Failure or success are not the measure of a meaningful life. He writes, "The key here is that meaningfulness lies not in what is achieved or recognized, but in how a life is lived." Further, it isn't necessary that someone recognizes how their life is meaningful, or even to pursue meaningfulness. The tears came from visualizing my mother's lifelong search for What Life is All About. Like me, she devoured writings of all sorts in the course of this quest. Philosophy, science, spirituality, religion, politics, environmentalism, etc. etc. And also like me (almost certainly, though I'm still alive), she died without realizing the certainty of understanding that she fought so hard to achieve. In this book's final pages, May's honest, clear, and cogent writing brought me to a deeper grasp of what may sound like an obvious, platitudinous, New Age'y bit of wisdom: it is the seeking, not the finding, that is important; there is no foundational truth outside the web of human searching; a life well lived is marked by the quality of one's living, not the quantity of outward accomplishment. Some sort of psychological dam broke in me. I suddenly felt, in a way new to me, that neither my mother's life, nor mine, was marked by failure because we were unable to find the answers to the Big Questions we so desperately desired. The intensity of our searching, the adventurousness of the quest -- these sorts of "narrative values" are what May persuasively argues are the core of meaningfulness. So thank you, Todd May, for writing a book that is both so intellectually provocative and emotionally satisfying. In my 66 years of living I've bounced back and forth between embracing existential meaninglessness and various forms of religiosity, mostly of the Eastern mystical/meditational variety. I've come to settle on a secular rationalism with some Taoist/Buddhist flavoring that, though appealing, lacked the coherent philosophical qualities that your book possesses. You've given me a great gift. I'm confident many other readers will feel the same sense of gratitude. May isn't into academic, word-splitting, intellectual philosophizing. He writes clearly, informally, and passionately about issues that everybody is deeply concerned about, such as the relationships between happiness, experiences, and meaning. What I like most about May's style is how he honestly considers arguments that are contrary to his own. Before stating his conclusion about something, he works through alternative ways of looking at that thing. May does this so skillfully, several times I found myself saying "Yes, that's so true!" to one of his counter-arguments, before changing my mind and saying "Yes, that's even more true!" to the thesis he ends up preferring. If all philosophers could write and think this way, modern philosophy would have a much better reputation than it does. May makes it into a very practical way of assessing what makes for "a good life" -- one of those terms that gets thrown around all the time, yet rarely pondered as anything other than a shallow platitude. Brilliant ideas. The author said sometimes he reads philosophy and wonders why he didn't think the thought himself. While his ideas open up a path for new thinking, he is right on, Il do have a sense of what he proposes. He is clear in his writing, making his work something I can mull for a very long time. May led me to think about life in ways I'd never considered. The meaning of life is not a question for many. May does not think Camus got it right. I do, but not in a negative sense. Camus and I are existentialists because there is nothing else in a godless world. Choose to enjoy life as best as you can. May could have better expressed his views by being less wordy and more precise.